Kyrus must learn a deadly game against opponents who already know the rules. He must join forces with his twin to combat threats in both worlds. One misstep or misplaced trust and Kyrus could find himself dying...twice. 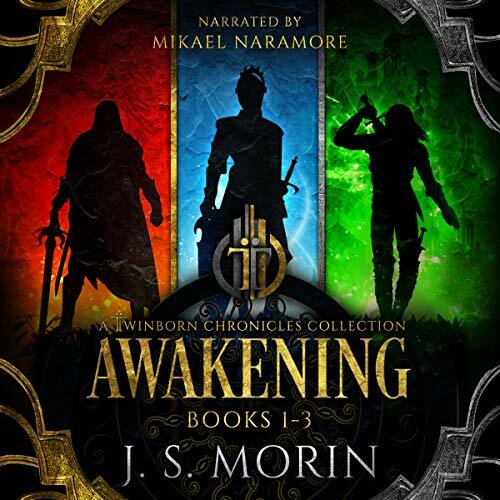 Twinborn Chronicles: Awakening Collection is a three-book collection chronicling the adventures of heroes who alter two worlds. For fans of epic fantasy who aren’t looking to start another unfinished series, the Twinborn Chronicles provides multiple new worlds to explore and all the closure you’ve long been denied. I usually look for fantasy books by length more than any other criteria (the longer the better) and I won't even pretend to have hesitated at a value like this one. 67 hours for a single credit was perfect! The story was a bit slow as it seeks to bring together more than half a dozen characters at a time; something which was frequently difficult to keep a rolling tally of; but I will admit that, to keep the review short and without revealing too much of the story, I was well pleased with my purchase by the end of the final part and went on to buy the next set of this series (books 4-7). 32 sur 33 personne(s) ont trouvé cet avis utile. Im obsessed with some of the current sci fi stuff on audible. I didnt expect to like this fantasy based one. I cringed with start but willed myself to listen to fist hour at least, because I adored Black Ocean series. I dont like fantasy and really dont like hobbits and goblins and kingdoms. But somewhere ... the characters developed and grabbed me. The way characters in Black Ocean did. I was intrigued. Then I realized the story is doing something I never heard of before. It became quantum physics or some kind of unknown possible science. I guess that is magic. Seriously great work. Intelligent while still being light, humorous, charming, and whimsical. I kept thinking they could all be aliens, why did he have to go the goblin route? But then I got it, and it all made sense and fell into line and I couldnt stop listening. Also, I think some people leave very negative reviews just to get refunded for books to take advantage of the credit system. When considering a review, it's a good idea to see what other reviews a user left. 41 sur 43 personne(s) ont trouvé cet avis utile. Amazing value, and kept me entertained throughout! I want to start off by saying as many others have, the first book in this series was somewhat confusing. There were so many different people and perspectives. The chime changing time or perspective was helpful, but didn't fully clear up the confusion. The concept in this series was exciting. You find real character development throughout. There are hardly any hollow, two-dimensional characters. Will not disappoint. I loved it. i have my new DnD campaign already written now. magic, weapons, villians, multiple planes of existence. it's all here. Great, morally ambiguous characters and cunning, yet relatable antagonists. Wonderful listen and a serious bang for your buck. this was an amazing collection of books that I have thoroughly enjoyed. if you enjoy high fantasy and well orchestrated plot along with deep and coherent world building then I recommend you pick this up at once. First off, very hard to argue with the value of a single credit for an astounding number of hours of listening. On the other hand, it's difficult to say that this was 67 hours well spent. Or maybe better to day that I bet I could have spent 3 credits on other titles and felt better after I was finished. Overall, the story was weak, the ending was unsatisfying, and the journey was tedious. The good: Really enjoyed the whole concept of the twin-born and the magic system. Creative and interesting, and adding the Source to the equation made that part of the story very interesting. I was completely taken in by the novelty of the concept and the people and skills that emerged in book 1. The antagonists were evil and the protagonists were good although there is enough to make you wonder! Made for clear direction and, except for a final twist, satisfying. Subsequent innovations with the formerly-sea-going-warships was innovative and cool. The Bad and Ugly: This whole series feels like it was written without the author ever going back and editing any consistency into anything that was written earlier. People literally changed personalities when they get to book 2. Don't get me started on the people changing sides or inventing their own objectives that seem to have no relevance to the overall book. Oh yeah, and lets not forget that the series goes from "OMG, we're being attacked"! to "I need to kill people to " further objectives that are obscure. Also worth comment is the complexity of the Twinborns concept itself. Constantly referring to the twin while discussing the other twin, and even swapping their names, is very hard to track on Audible. If I'm talking to Joe, but refer him as Charlie, his twin, I have to make a major mental effort to complete the equation. Along those lines, let me also disparage the amazingly awesome, but astoundingly difficult to parse, communications between the twin-born. If you've read it, you know what I mean, if not, lets just say that I had to pause the book multiple times to figure out how a message got from person A to person B. The narration was a mixed bag, I like Naramore, but he was handicapped by his range and by apparently not reading the books before reading the script. There was a jarring issue with him switching to giving the Twins the same voice towards the end of the first book. They had unique voices until the narrative made it clear they were the same (sort of) person. While it made sense that they have the same voice, the switch made you lose the verbal cues that identified individual characters. It made the whole series more confusing. I liked his Rashawn character and his snarky personality was awesome, but ultimately, his emotive range for that character was below expectations. Absolutely love it! A rich and diverse tale masterfully told!!!!!! Highly recommend to anyone wanting new worlds to dive into! reminiscent of Wheel of Time , mistborn , et al. I can't wait to read the next series. This story is great but im starting to get tired of Brannis and how useless he is. And Julianna is kind of annoying. I wouldve really liked for Kyrus to fall for someone on his own and not because of Brannis' feelings for Julianna. Ich fand die Geschichte sehr angenehm und von der Idee her sehr gut. Das hielt an, bis es in Buch 2 einen aus meiner Sicht brutalen Logikbruch gibt. Kyrus Hinterdale wirkt etwas verträumt, eher schüchtern, über sich selber erstaunt, etwas verängstigt, denkt nicht immer über seine Handlungen nach und scheint ein eher treuer nicht sonderlich willenstarker Mann zu sein. Danach sind von alle diesen Eigenschaften nurnoch die gelegentlichen Impulshandlungen vorhanden und wir haben quasi einen zweiten Brannis. Das wäre für mich noch verkraftbar, wenn Kyrus (Brannis 2) nicht urplötzlich seine Zuneigung zu Abbaly komplett vergisst und kurzt darauf Brannis bessten Freund hintergeht, indem er mit dessen frisch vermählter Frau schläft. Dies würde noch habwegs Sin machen, wenn es Brannis wäre, denn dieser war mit der Frau einmal verlobt und sie seine große Liebe und er ihr Märchenprinz. Aber mit dem Logik- und Ehebruch dazu kann ich ab dieser Stelle diese Buch selbst mit Ekel nicht weiter hören, wenngleich es bis dahin recht gut war.